The Hot Breath of War takes seemingly unrelated episodes of life during wartime and entwines them into one narrative. This subtle and well-written novel explores love amidst conflict and the seduction of violence itself. Alixopulos has a cartooning ability well beyond his years and his stories offer some of the most thoughtful insights available to comic book readers. The drawing is loose and comfortable but sharp and graphic. 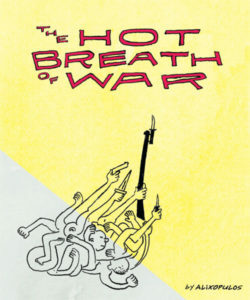 The Hot Breath of War is perfect for fans of Joe Sacco or Jules Feiffer, but stands as a unique work of graphic art. Trevor Alixopulos is the creator of numerous minis, as well as Mine Tonight. It was nominated for “Outstanding Graphic Novel” in the 2008 Ignatz Awards.